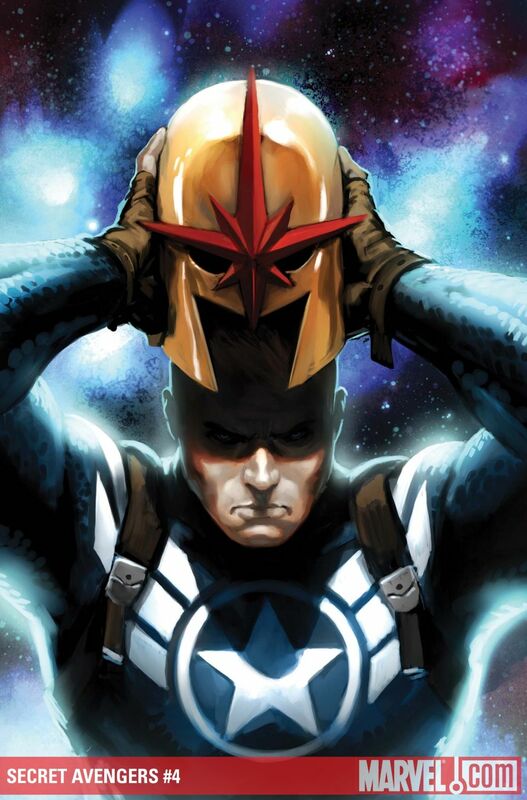 Based on the cover, and last months Secret Avengers #3, we all new Steve Rogers was going to put on Nova's helmet and gain the Nova power. What could be cooler than giving the Marvel universe's greatest tactician and leader some of the greatest powers in the universe for an issue? Having him be able to tap into them in later issues. The three star uniform that appeared on Rogers when he transformed into Nova mode was a bit corny, but also kind of neat. It reminded me of when a video game character gets a power up and gets to be in a unique costume. It is kind of like when you get to be hammer'n Mario in Super Mario Bros. 3. Not exactly the frog get-up (because it doesn't make you look ridiculous), but still elaborate enough to be a fun change. The first arc which concluded with the comic of the day, Secret Avengers #4, was alright, but I have a feeling once Ed Brubaker gets further involved with his team's characters he will tell a tighter story. After reading Captain America (Brubaker's main title) for the best several years I think I expected something a little more espionage based or gritty. I'm thinking the next arc involving a certain one-eyed spy may get things all nagey...well, it should be a word!